Antique Chinese snuff bottle of a flattened oval form with recessed foot, encrusted with finely crushed turquoise. The stopper has a jadeite lid with bright apple green coloration. 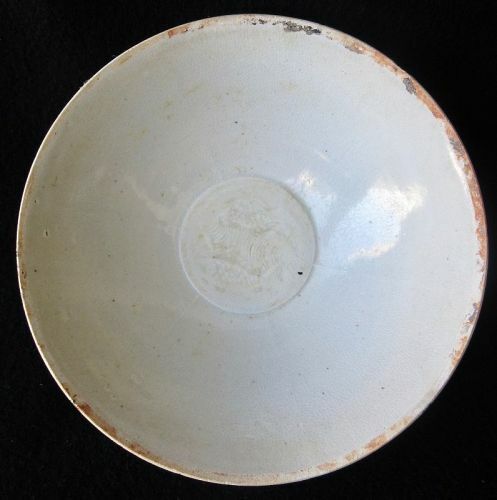 Chinese qingbai porcelain bowl, egg shell thin body with pale celadon crackle glaze. The well of the bowl incised with two swimming fish over waves, the edges slightly lobed, the rim left in buff. The exterior body is ribbed down to the short foot, and the base of the foot slightly recessed and left in buff. Chinese pair of fu dog temple guardians, carved hardwood with old remnants of blue, red, and white pigments. Each fu dog is formed with intricate detail and expression, one with a pearl in its partially open mouth. Mounted on steel plates for museum quality presentation. 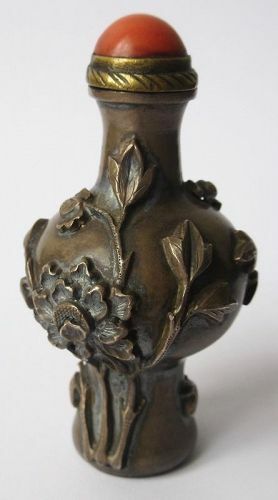 Chinese bronze snuff bottle, decorated with high relief chrysanthemum flowers. The stopper has a coral top and the base of the snuff bottle with maker's cartouche reading "Zu Wen". 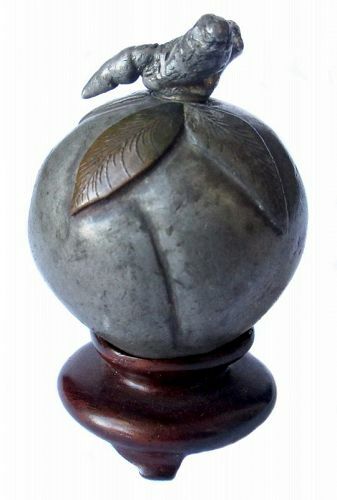 Dimensions: 1 1/2" x 2 3/4"
Chinese pewter snuff bottle in the form of a peach with three leaves, one leaf done in copper. The pewter stopper is formed like a natural stem with attached spoon. The snuff bottle rests on its own small hardwood tripod base. 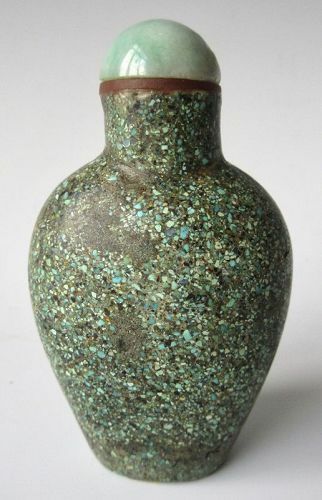 Chinese snuff bottle carved from turquoise mottled with natural dark brown veining. The front is carved in relief with a cat staring intently upwards at a nearby flying insect, surrounded by flora. The reverse is carved in relief with a bird perched on a flowering tree branch. The turquoise lidded stopper carved with lingzhi mushroom motif. 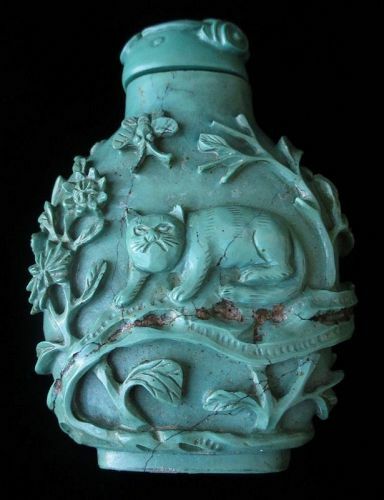 Chinese antique snuff bottle, carved entirely from turquoise in the form of a small adorable toad. The lower body of the toad appears more green and transitions to the classic turquoise blue in the upper body and face. the stone is mottled with natural dark brown oxide veining. 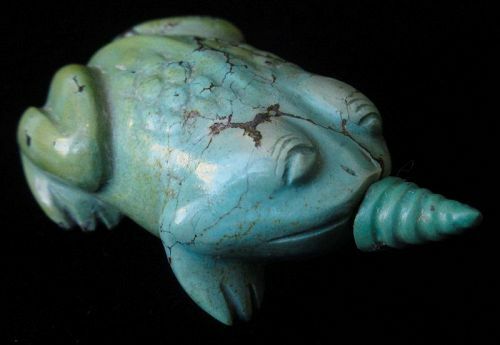 The small toad is carved with a smiling, open mouth with a carved turquoise stopper. 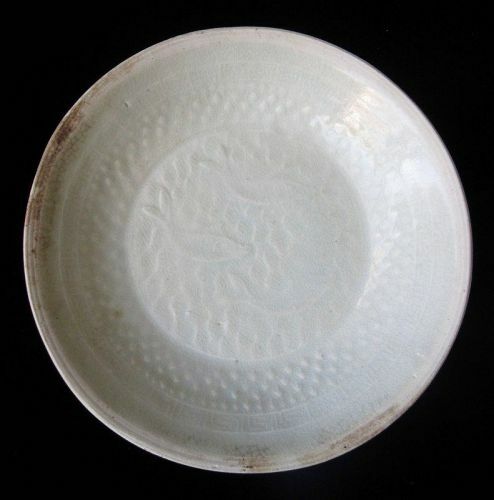 Chinese porcelain dish with Qingbai light blue-green crackle glaze and very thin form. The well of the dish with incised motif of three swimming fish on wave ground, and low relief geometric scrolls and arrows along the inner edges, the rim left bare from glaze. 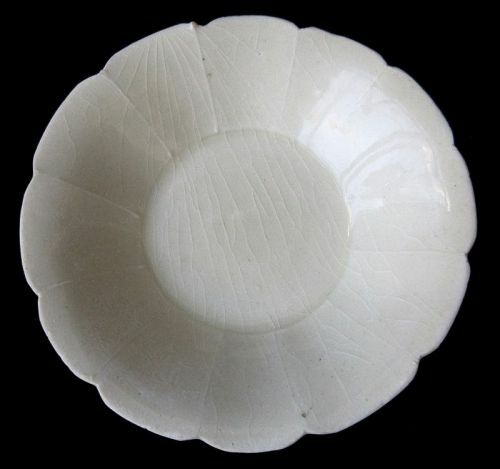 The outer body slightly lobed and the foot is shallowly recessed and very wide and flat. 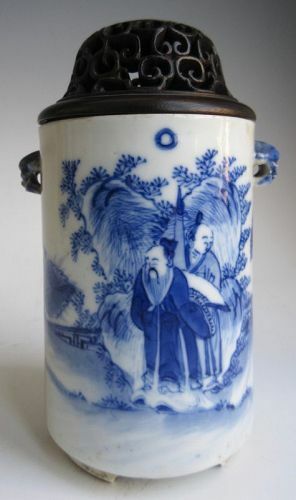 Chinese blue and white porcelain tripod incense vessel with a hardwood lid, carved with openwork lingzhi mushroom motifs. The vessel body depicts a scene of an old scholar with attendant stood against a large rock formation, the sun in the sky above and the moon on the reverse side. Two fu dog heads form the pierced handles on the vessel. With short, tripod feet.